Alciato at Glasgow: Emblem: Anechou kai apechou. Et nimiùm felix saepe timenda fuit. Multa pati, illicitis absque tenêre manus. In dextro: sic se continet à gravidis. A man must bear unhappy chance by seeing it through, but too happy a lot has often proved fearful as well. Hold on, Epictetus used to say, and also, Hold off. One must endure many things and also keep one’s hands away from what is not allowed. 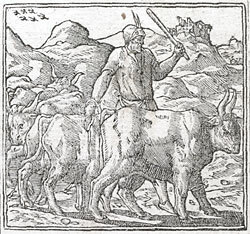 Even so the bull submits to the herdsman’s will, chained at the right knee, and so keeps away from the pregnant cows. 1. Aulus Gellius, Noctes Atticae, 17.19.5-6.